I have finished my first MAME cabinet using the UAII kit, SlikStik controls, and a 27" TV. According to this, you haven't built your cabinet yet. Seriously, good job. Looks great. Btw, posts have been erroring for me like that too. Charlie Brown: I'm still hoping that yesterday will get better. This cabinet looked so good that I decided to copy it exactly (I hope you don't mind). I just orderd all of the parts in your instructions except the computer, TV, and speakers. You should get a commission! Some of the parts cost a little more than you listed including shipping. So far, everything cost around $1400 shipped. I felt like this is a good deal compared to buying a slikstik cabinet/controller combo for $1700 + $90 for the overlay + $300 shipping = $2100. Originally, I was going to go with the overlay and marquee with characters on it, but after looking at other MAME box pictures on the internet, I decided that looked too gaudy and tacky. No offense, but the mame marquee with lighting bolts seemed pretty dorky to me. However, I could not deny how awesome your box looked, so I decided I better not risk anything and just copy exactly what you did. The one thing I realized maybe is missing from your setup is plexiglass over the TV. To me, that seems like an important feature. Is there a good way to include it with this setup? Looks awesome. I'm wondering how well that SlikStick panel works for Robotron? It seems like the joysticks are too far apart. Great write up! And the cab looks really good too. How is the TV mounted in the cab? Is it decased, etc? Just wanted to say thanks for posting your original article. It inspired me to build my own MAME cabinet. 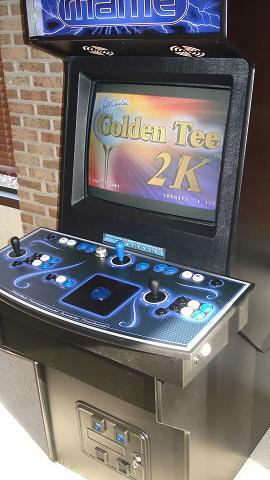 I had originally considered purchasing a Golden Tee game but I was appalled at the prices. Your article convinced me that I could take on as much (or as little) as I wanted. I ended up building an Ultimate Arcade II after ordering plans. I'm still customizing everything but hope to be done by Thanksgiving. Page created in 0.186 seconds with 30 queries.